Frosty white Quartz Scepter Crystals with inclusions of hematite from Africa. 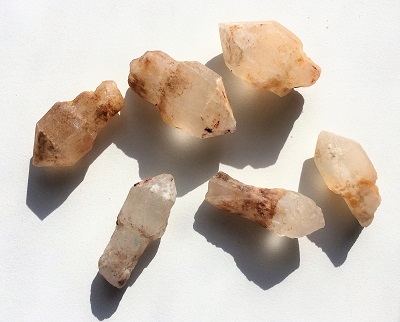 Scepter Quartz Crystals are excellent crystal healing tools for the transmission of directional energy. Combining the elemental energies of Storm with the directional power of Fire, Quartz Scepter Crystals support creativity and encouraging action. Scepter Quartz crystals open the creative mind and helps one to manifest thought into physical form. 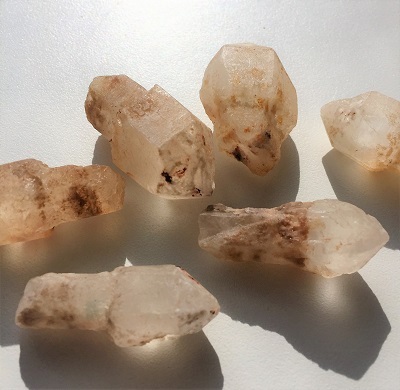 Helping one to regain personal power, Scepter Quartz crystals help one to overcome a lack of motivation and feelings of procrastination, and take charge of making necessary changes in life. Adding to the potential of this crystal is the energetic properties of Hematite and Quartz Crystal as this crystalline combination also helps to create healing support and positive action coupled with an abundance of physical energy and vitality. Hematite is an excellent crystal tool for grounding and protecting, harmonizing mind, body and spirit. Hematite is a stone of integration. Hematite facilitates the path to a peaceful way of being. Following the Law of Attraction – “Like attracts like,” Hematite is helpful for those manifesting dreams into reality. Scepter Quartz Scepter Quartz Crystal facilitates the channeling of higher vibrations. 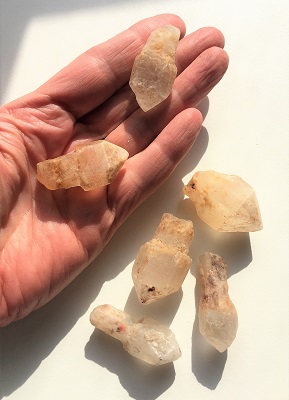 Scepter crystal brings the spirituality of the higher planes into healing ceremonies and sessions; focusing healing vibrations on the “heart” of the matter, at all levels – physical, etheric, emotional, mental, and spiritual. Scepter Quartz stimulates the aura, helping one to feel more energetic and positive about moving forward in a new direction. 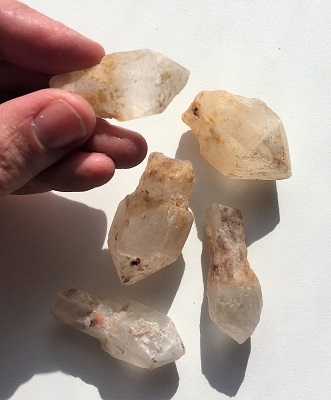 In healing, Quartz Crystal is a master healer and may be used for any condition. Quartz Crystal brings the body into balance and harmonizes all the chakras and aligns the subtle bodies. Hematite may be helpful with the absorption of iron, the formation of red blood cells, and in cleansing the blood. Hematite helps with the regeneration of tissue. Hematite treats leg cramps, anxiety and insomnia, aids spinal alignment and fractures. Hematite may also be useful in detoxification and strengthening the liver.